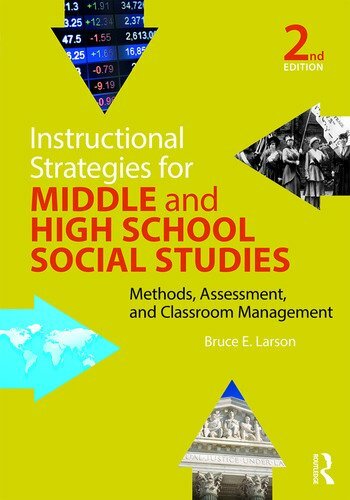 Instructional Strategies for Middle and High School Social Studies: Methods, Assessment, and Classroom Management is an exciting methods-based text that integrates appropriate management and assessment techniques with seven distinct teaching strategies. Writing explicitly for pre-service social studies teachers, veteran teacher educator Bruce E. Larson offers detailed descriptions of a range of instructional strategies, along with guidelines for deciding how and when to use each. Part I offers the foundations for teaching and learning in a social studies classroom, and explores contextual, theoretical, and policy factors that all teachers need to consider before entering the classroom. Part II delivers a range of comprehensive strategies for providing instruction that is appropriate for particular lessons, student abilities, and classroom environments. The practical strategies in Part II build upon the learning theories described in Part I, positioning Instructional Strategies for Middle and High School Social Studies to be the go-to, all-inclusive teacher’s guide to the social studies classroom. A list of goals before each chapter presents an overview of the chapter’s content focus, and provides an outline for the chapter review. Extensively revised Part I (chapters 1–4) provides an updated review of national standards developed for teaching history, geography, civics, and economics. In-depth applications of the Common Core State Standards for the social studies are also explored. New "Reality Check" feature provides directions for integrating field-based experiences into the chapters, and contextualizes the ideas in the book for a classroom setting. Each chapter in Part II (chapters 5–11) has been expanded to include a section labeled "Enhancing Student Learning with Technology," offering websites, links, and other resources for integrating recent technologies into the classroom. Chapters 5–11 include a new "Making Your Lesson More Meaningful for ELLs" feature, which provides ideas—based on current research and theories about learning language—for engaging ELLs, specific for each instructional strategy. Expanded discussion of the "Understanding by Design" model equips teachers to design learning experiences that promote student understanding by intentionally designing what happens in the classroom, and developing authentic formative assessments of student learning. Bruce E. Larson is Professor of Secondary Education and Social Studies at Western Washington University.